In the town of Queen Creek, Arizona, with its vibrant community and hometown feel, discover Aperture at Gateway Quarter. Here in the 85212 zip code you’ll find beautifully built new homes with great curb appeal and pool-worthy backyards. Walking trails run throughout the community, with a large park that’s a natural gathering spot for neighbors. Schools are minutes away, as are the retail and restaurants of Queen Creek Marketplace. Phoenix-Mesa Gateway Airport is conveniently close, and easy access to the 202 makes the entire Metro Phoenix area well within reach. The new homes of Aperture at Gateway Quarter range from ~1,900 to ~2,400 square feet, with 3 to 4 bedrooms and 2.5 to 3 baths. 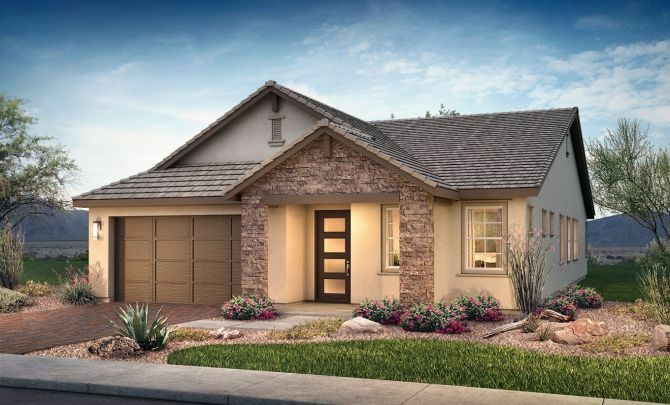 These single-level homes offer open-concept floorplans that feel spacious and comfortable, with gourmet kitchens, elegant baths, energy-efficient features, and front yard landscaping all included with each new home.